Sometimes things just don't go as we plan them to. Today is WORLD AIDS DAY and it is surreal to me that I am sitting in my favorite yellow chair in Swaziland writing this blog. I am not just in Swaziland, but I am in the epicenter of this disease that is wiping out families, communities and hope for this tiny Kingdom in southern Africa. AIDS is not just affecting people in Swaziland, it is a pandemic of epic proportions that is affecting families in countries all over the world, including yours. 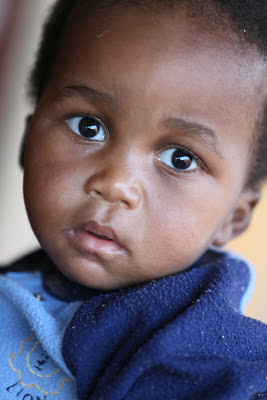 Today I want to make WORLD AIDS DAY personal for you and introduce you to a little baby boy named Caleb. Caleb came to the El Roi baby home in April 2012. His father brought him to us in a cardboard box and asked if we would take him because the father himself was dying of the disease. Caleb’s mother had already passed away (or was “late” as we say here in Swaziland) from this ravaging disease and the father, who refused his own treatment, was left caring for an 8-month-old boy who was wasting away before his very eyes. Caleb arrived in very bad condition and Helen and the Aunties at El Roi got to work immediately. 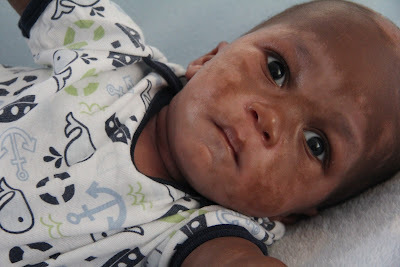 First was a time of prayer over this baby so that he would live to be a walking testament to God’s faithfulness. Next was a bath, and the discovery of open and oozing sores all over his body. “Jesus help us,” Helen said as she tried to care for him without hurting him more. That was impossible based on the seriousness of his condition. We were still living in Georgia when Caleb arrived and I remember wishing so desperately that I could be in Swaziland to help. Helen called a couple of times and was very concerned that Caleb was not going to make it. How could we have a little baby, one of our first ones, die in front of our eyes? Caleb had been on ARV’s (Anti-retrovirals) since birth because the doctors knew that his mother was HIV positive. It is not a “sure thing” that a baby will be born HIV positive if the mother is HIV positive, but the virus is passed on during childbirth and without proper care (and even sometimes with proper care) it cannot be avoided. Caleb contracted HIV from his mother during birth and it will be with him for life. While his father tried to give Caleb his medicine at the exact times of day that they were required, he couldn’t provide the care (food, protein, diapers, cleanliness) that little Caleb needed to survive, and in a last chance attempt to save his life, the father brought him to us. After going through a few weeks where Caleb’s future was unknown to us, he turned a corner. It was truly a miracle. It really is amazing what proper care, food, love and medicine can do for a person. Within a couple of months Caleb’s health improved greatly, but the scaring on his face did not look good and his eyes still showed shear terror. Helen, Thabile and Gcabile continued to pray for and care for this little one without ceasing and he improved every single day. Before I left for Taiwan in October this photo was taken by photographer Chris Savas – you can see that not only does Caleb look healthy, but the fear in his eyes is gone. He has been emotionally healed and his physical condition has improved so much. Yesterday I stopped in for a visit at El Roi and Caleb was sitting in a highchair eating the equivalent of Cheerios here (we can’t get Cheerios in Swaziland). He looked up and me and said, “MAMA!” and handed me one of his little cereal bites. I am sure that he calls all of the Aunties “Mama”, but at that moment my heart absolutely melted, and I took the sticky piece of cereal and thoroughly enjoyed eating it. We will never know what this little one endured before he came to us, but I can tell you that many others are suffering as he did right now as I write this blog. Today is WORLD AIDS DAY. Maybe some of you knew that and maybe some did not. But today, you can help someone in the world suffering from this terrible deadly disease that has wrapped its arms around the globe and is starting to give the world a squeeze. There are 50,000 new HIV infections in the US each year. If you think HIV/AIDS can’t infect or affect you where you live, you are wrong. If you can help us help one more child today please do so by clicking here. This is the season of giving so please help us at the El Roi baby home so that we never have to turn another “Caleb” away. Live from Swaziland … it really is WORLD AIDS DAY. Labels: Caleb, WORLD AIDS DAY. How many Grandchildren am I feeding?